Frozen Beverages of Iowa offers our customers a complete line of medium and high-volume frozen beverage machines seen below. Our machines may be purchased, leased-to-own or rented based on your individual needs. Our most popular slush machine brands include Stoelting, Ugolini, CAB and SaniServ. Other drink preparation and dispensing machine brands available for purchase only include Cornelius, Cecilware, BlendTec & VitaMix. Frozen Beverages of Iowa backs every leased-to-own or purchased machine with the manufacturer's warranty on parts and a limited 12-month guarantee on service. After 12 months, we will service your machine annually and provide a multi-point inspection for a nominal fee. All new machine purchases will receive a complimentary case of Slush Puppie Brand product (up to $640.00 worth of gross sales). If your machine needs repair and will be out of service for a length of time, we have a loaner program, at no charge, to keep you in business. If your machine needs cleaning when we arrive for a service or repair, a $25.00 cleaning fee will assessed. When you rent from Frozen Beverages of Iowa, we will deliver a sanitized, fully-functional machine to you with no hidden costs. A nominal fee will be charged for all seasonal/annual rentals. A minimum charge of $150.00 per machine will be invoiced upon delivery for seasonal rentals. The Summer Season runs from June to August. The School Season runs from September to May. Seasonal rentals less than the above periods will be invoiced at the full rate upon delivery. Annual rentals will incur a charge of $300.00 per year and are usually billed in 6-month increments. After one year we would like each year round customer to consider purchasing similar equipment. We do not sell our used equipment!!! Large account customers and charities may have their fees waived and receive other incentives based on purchase volume. Rates are negotiable for customers who wish to purchase new equipment. Event Rentals are available for $125.00/day or $150.00 for the weekend ﻿plus a $25.00 delivery fee within 20 miles of Iowa City, IA. An additional delivery fee may be required for delivery beyond 20 miles of our warehouse location. Customers are requested to purchase at least two gallons of product. All unopened product and supplies can be returned at no charge. We also have plenty of cups (9, 12, 16 & 20 fl.oz.) with lids and straws to meet your serving needs. Stoelting 100F. 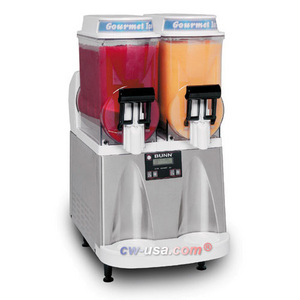 This high-volume slush machine is our most popular model. It is capable of producing 100 cups per hour under normal conditions. This machine is a one-flavor machine with a 10-gallon capacity. Customers can choose a nuetral base product and offer up to 6 flavors from the front-mounted dispensing bottle tray. 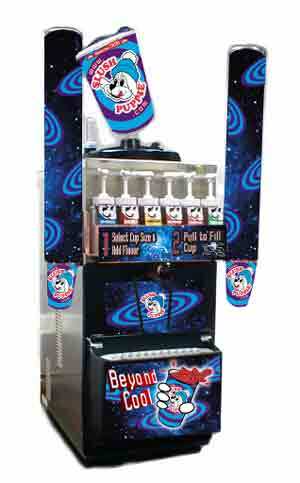 Cup dispensers and point-of-sale advertising can be customized to your operation. We also offer a tailored dolly to mobilize your machine. The machine operates on 120V, 12 Amps. Stoelting 100C. This machine is very similar to the 100F and is designed to sit on your counter top and take up less floor space. It can be customized and loaded with the same high quality Slush Puppie Brands. The machine operates on 120V, 12 Amps. SaniServ LK50, LK100 & LK700. SaniServ machines are designed for high rate, indoor or outdoor use. They are well insulated to produce a constant output under all conditions. These models are 120V and can be set up on any counter or suitable rolling cart. We also offer the LK200 in 230V for even more capacity at high output. Bunn Ultra-2. This machine is a medium volume 2-bowl machine designed to visually display your Slush Puppie frozen beverage products. It has a compact design and runs on a 120V, 12 Amps. Clean-up is easy with removable bowls, spigots and augers. It has a reversing auger to distribute product evenly during the freeze cycle. Chilled or slushed drinks can be prepared in one or both bowls at the same time. Ugolini 2-Bowl or 3-Bowl. We offer both of these Ugolini medium volume Granita machines with a mechanical or magnetic drive option. The magnetic drive machine results in less down time. No more freeze-ups and broken shear pins to replace. Like the Bunn Ultra-2, you can chill or slush at the same time. All Ugolini machines are 120V, 12 Amps. Faby CAB 2-Bowl. 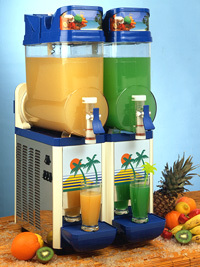 This Italian-made medium volume slush machine is suited for areas where heat bulid-up is a concern. The CAB freezing system is designed to keep up when the temperature rises. It keeps up outdoors except in direct sun. Perfect for catering or patio functions. This machine also operates on 120V, 12 Amps. Copyright 2009 Frozen Beverages of Iowa. All rights reserved.